It’s part of an ongoing series called Thru the Cultural Lens in which educators learn about Southeast Alaska Native culture and history. Saturday, they gave presentations on 10,000 years of education in Southeast Alaska. Jackie Kookesh is the education director for Sealaska Heritage. She is Tlingit and is part of the L’uknax.ádi clan. She was born and raised in Juneau’s Indian village. Kookesh is in charge of Thru the Cultural Lens. Kookesh said this is Sealaska’s fourth year offering the program and in that time they’ve worked with 67 educators in Juneau School District. Nineteen people are participating this year, including Juneau School Board member Josh Keaton. The last session will be held in November. Kookesh said the program leads its participants through the politics and history of Southeast, and it gives them an overview of Southeast Alaska Native culture. “We explore topics like the arts, subsistence life ways; we explore it all in that 50 hours,” Kookesh said. Kookesh said she saw firsthand how damaging a school that doesn’t reflect Native students’ culture can be to be to them. She was in the Juneau School District in the late 1950s and in the 1960s. She said the atmosphere back then was much worse than today. She left the district to attend a Bureau of Indian Affairs school. Kookesh’s experience is part of the reason she wants to continue offering Thru the Cultural Lens. She believes the program is successfully helping teachers fulfill their own desire to build stronger relationships with their students. Ed Becker is a social studies teacher at Yaakoosgé Daakihídi Alternative High School. He has high praise for the program. “I teach Alaska history and world history, and U.S. government. It’s definitely going to cause pause and create some more work for me, but more opportunities for my students to be engaged and learn,” Becker said. 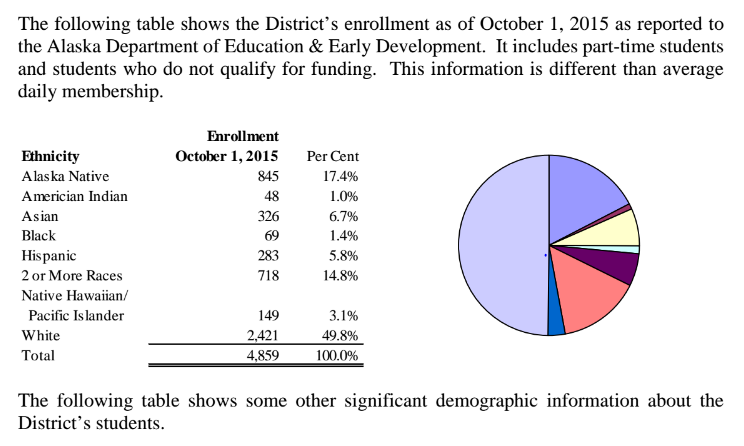 Last year, 17 percent of the district’s students were Alaska Native. 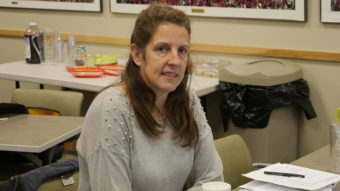 Angie Lunda is an assistant professor of education for the University of Alaska Southeast. She is Tlingit from the Kaagwaantaan clan and she is teaching today’s session. “What I hope is that it will cause teachers to dig deep in themselves to really try to reach students where they’re at, to really build on the background knowledge that students bring, to really base the education in this place,” Lunda said. She said connecting to students through their culture and what they already know about Southeast can help with real problems like the achievement gap between Alaska Native students and non-Native students. The state Department of Education has reported that in 2015 more than a third of Alaska Native students failed to graduate after four years of high school. That’s compared with one in four students overall. 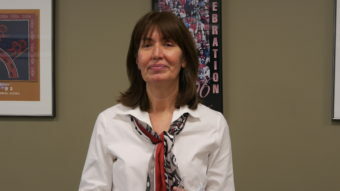 Dianne Zemanek is a math and science teacher at Dzantik’i Heeni Middle School. She sees Sealaska Heritage’s seminar as an opportunity to continue building on efforts at her school to bring Native culture into their classes. “We took the core cultural values of the Native Tlingit, Haida, Tsimshian people and took those values to our kids and then asked them to connect to those cultural values and explain what it looks like in our school,” Zemanek said. In her own classroom, she’s trying to use Alaska Native methods for building halibut hooks in her math lessons.